The inception for this deliciously simple meal came from Hyacynth, who shared her recipe this weekend. 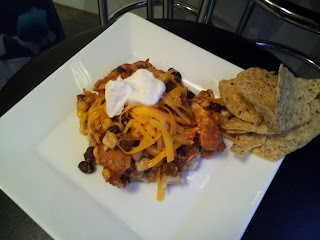 I made this southwestern crock pot chicken earlier this week and found a million delicious uses for it. 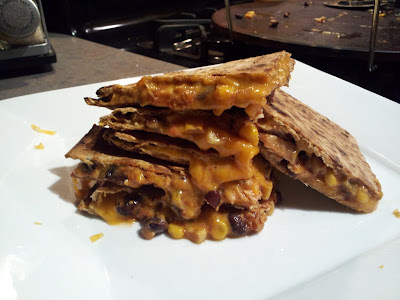 I made quesadillas for Mandy with this as the filling, adding cheddar cheese and sandwiching it between two whole-wheat Flatout tortillas and crisped up under the broiler (please don't tell my sister I secretly fed her healthy stuff. She might claw out a kidney for that injustice). Hyacynth serves this to her kids over a bed of rice, but I also tried cooking up some amaranth to serve with the completed chicken, which also got a healthy dose of cheese and sour cream. My favorite combo for this dish was a scoop of chicken topped with a bit of cheese and eaten with whole-wheat tortilla chips. It was filling, healthy, cheesy and crunchy. The perfect lunch combo, in my opinion. Place chicken breasts in the slow cooker, then top with remaining ingredients. Cook on low for six hours, then use a fork to break chicken breasts into chunks. Bake on low for another hour, if possible. This makes at least six large servings and freezes well.